So I was watching Mythbusters and they were testing Cola myths. Now on occasion I have been known to enjoy my soda. And I know soda, particularly the darker colored ones aren't particularly good for you but this was an eye opener. Help remove blood- They spilled some animal blood on the concrete and a car bumper and 2 hours later poured some cola on it and the bumper, and funny enought the cola doused blood stains came away easier. Off the car bumper it came off without leaving a hint of color. Kinda gross. Clean Chrome- they cleaned the chrome but pouring cola on it and rubbed it with tin foil, and it really worked, turned old shineless chrome to almost brand new and sparkly. A Penny- rusty old pennies turned real bright and shiny with both. A Tooth- tooth in acid lost about 50% of its volume, the tooth in the cola turned, well, nasty nasty brown and it looked really really gross. A T-Bone Steak- the acid turned the meat really soft, and the cola turned it really funny looking and fork tender. Again, really gross. So, all in all, cola didn't hold up to well to its myths, but what it did do as just nasty. I was never a big coke drinker and seeing what it did on the show, um, I'm gonna drink something else. 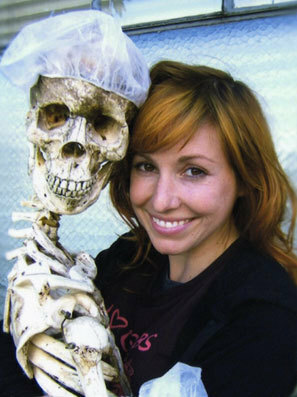 If you haven't seen Mythbusters, give it a try, its really pretty interesting. Some of the tests are a little suspect, but it's lots of fun. And besides Kari is kinda cute.